The Landscape Change in the Upper Loddon Catchment Green Army Project concluded in early November 2015 after 6 months. 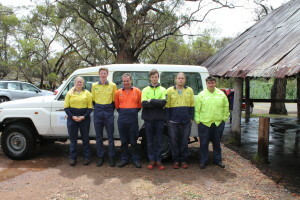 The project achievements were celebrated by participants and partner organisation members with a BBQ and thank you speeches from Glen Terry and Mark Woods (Manpower Group), and Project Manager Anthony Gallacher (Loddon Plains Landcare Network). The project was a joint venture by the Network with Connecting Country, Wedderburn CMN, Bush Heritage, North Central CMA and Trust for Nature, encompassing 16 sites and a variety of activities. Activities included fencing, tree planting, seeding, weed control and erosion control, from areas around Wedderburn down to Castlemaine. Many thanks to Manpower Group as the Service provider and Mark Woods as an excellent Team Supervisor. The Network wishes participants all the best with their future endeavours including study and employment. With the success of this project, the Loddon Plains Landcare Network submitted, and has been successful in an application to have another Green Army team return to the district in the second half of 2016. The Network is partnering with the North Central Catchment Management Authority, Wedderburn CMN and Bush Heritage Australia, with Manpower Group to once again be the Service Provider for the project.